1. Where in the Black Hills area can shoppers find/see Caroline’s Carts? 2. How did you learn about them, and can you describe the process of how they came to be in this area (i.e. what role did the KJW Foundation play)? 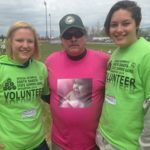 Spring of 2015 the Kenadi Jean Weis Foundation received a Facebook message asking if we had ever heard of Caroline’s Cart. Gramma Jean requested information from Caroline’s Cart, a shopping cart created by the mom of a daughter with special needs. Technibilt, a leading shopping cart manufacturer located in North Carolina, and distributor of Caroline’s Cart sent me brochures and promotional material. 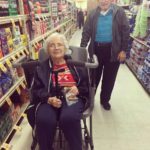 After seeing Suzanne Purvis at the market pushing Cynthia’s wheelchair and trying to maneuver the shopping cart, I was even more motivated to so something in our community. 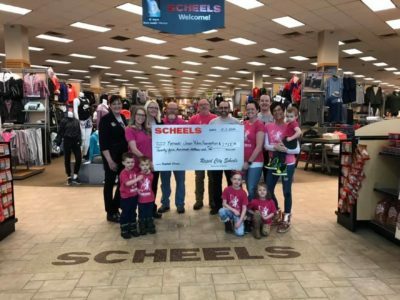 Part of the Kenadi Jean Weis Foundation’s mission is to advocate for families of children with special needs so, this was the perfect opportunity to do something for these folks. I discovered that Caroline’s Cart was approved at Kroger, Shop-Rite, Publix, Food Lion, Hy-Vee, WinCO, Pick N Save, Whole Foods and offered at forty commissaries across the US but nothing in our area. 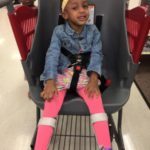 When Kenadi outgrew the infant seat and didn’t have the trunk support to sit up in a typical shopping cart seat, I would hold her in my lap on the motorized scooter at Walmart. This was not ideal for buying groceries but, Kenadi loved the ride. I found out that Caroline’s Cart was approved for Walmart in Canada but, was still in a testing stage at Walmart USA. I wrote letters and sent emails to Walmart in Spearfish and Rapid City anyway. Caroline’s Cart website revealed that their shopping cart was available at 21 Target Minneapolis-based stores, one in Sioux Falls, South Dakota. After reviewing testimonials and photos, I wrote letters, sent emails and Facebook messages to Target Corporate. I was informed that Target was trialing the cart in select locations and investigating introducing them to the public. Just before Christmas, I visited the Target Rapid City Store and spoke with the Manager about ordering Caroline’s Cart for their store and it wasn’t long after that, that I was notified by Target Corporate that they were rolling out Caroline’s Cart nationwide in March of 2016. I visited the Spearfish Safeway Store Manager, contacted the Customer Support Center and spoke directly with the Safeway/ Albertson’s Denver Division Public Relations Manager about ordering Caroline’s Cart. They expressed an interest and requested more information, which I provided them with. My husband suggested I check with family-owned Lueders Food Center, which I scheduled a meeting the next day and before I even finished telling them why I wanted it and the benefits for everyone Doug was on the telephone ordering not one, but two of Caroline’s Carts- one for each of their store locations in Spearfish and Belle Fourche. Two days later, I heard back from Safeway Corporate and they agreed to order one for their Spearfish site. Last week, I learned that Caroline’s Cart is now approved at Walmart in the USA so I approached local management and wrote letters and emails to Walmart Corporate. We are still waiting to hear back. 3. 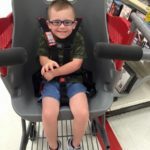 For people who may not have experiences with children with special needs, can you describe some of the ways this kind of cart impacts the shopping experience for parents, children, other shoppers, etc.? Caroline’s Cart was created for special needs individuals. 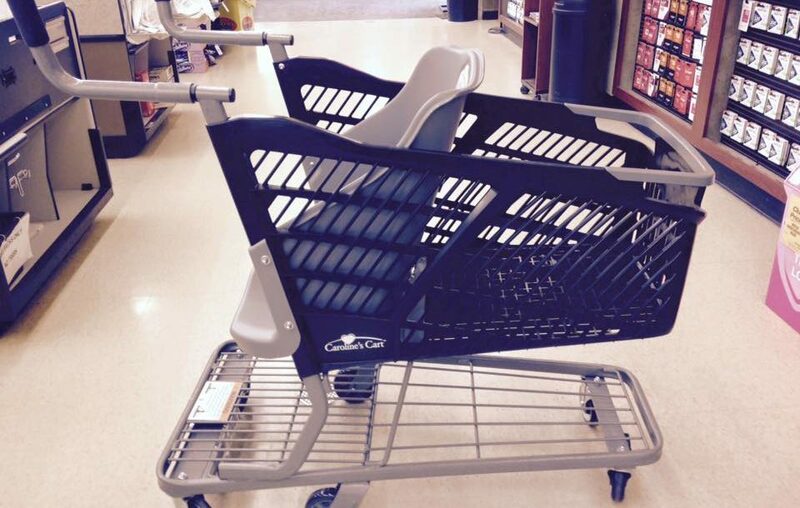 It provides caregivers a viable option to transport a special needs individual through a store while shopping, without the impossible task of having to manipulate a wheelchair and a traditional shopping cart at the same time. 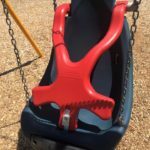 It features swing-out handles for convenient access to the seat, a contoured seat that holds a person up to 250 pounds, a five-point safety harness for security, a locking brake system for stability and spacious cargo basket. 4. When approaching different stores about the possibility of adding Caroline’s Carts to their offerings, what were their reactions/how did they respond? 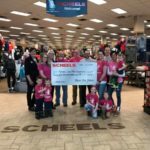 Target, Walmart and Safeway have corporate policies you have to deal with but the beauty of a locally-owned business like Lueders is that they can make their own decisions. 5. What is your hope now that people have access to the cart here? 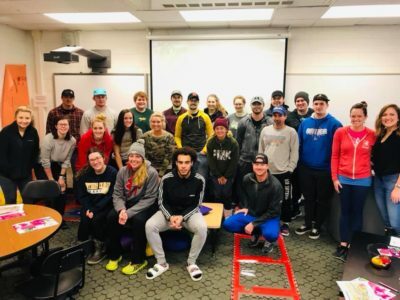 Caroline’s Cart will provide a quality product for individuals who need assistance, enabling them to participate in mainstream society with their family through the everyday activity of grocery shopping. 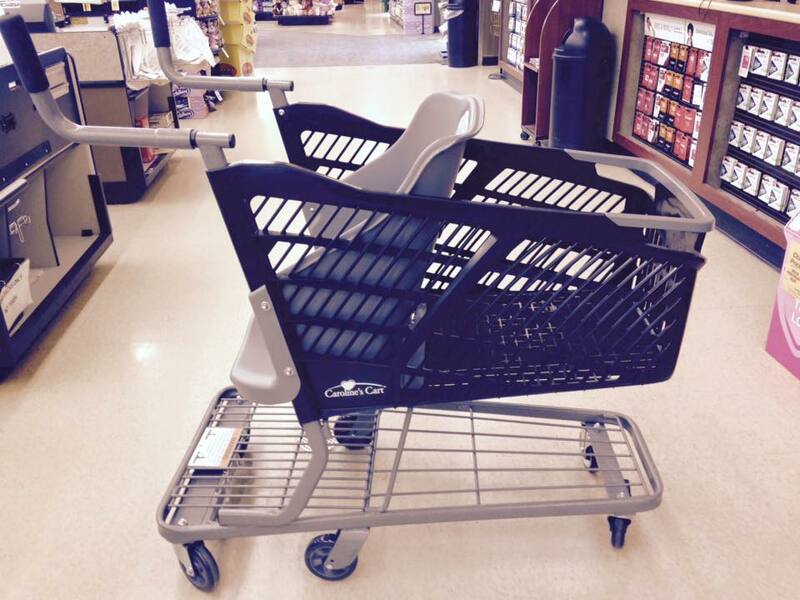 I hope that every retail store nationwide will eventually have one of Caroline’s Carts. One in five Americans lives with a disability and there are six million school age children in the US that are affected by disabilities. 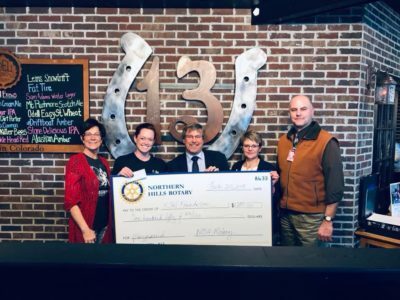 We have at least ten local families with uniquely-abled children, as well as 146 residents of the Northern Hills Training Center in our own municipality. 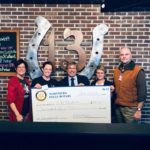 These patrons will find shopping to be easier, and the goodwill they feel toward these stores that offer Caroline’s Cart will translate into more customer loyalty. A huge thank you to our amazing community that has once again blown us away with their fantastic support, generosity, and kindness. We are changing lives because of each and every one of you. On Wednesday we were in Rapid City as Anthony had a sensory swimming class, which is a bit overwhelming. I knew I had to go to Target, and was dreading it. Anthony would prefer to sit in the car while I run in as he really struggles going into stores- way too much sensory going on! But, because we were getting a Father’s Day gift for his Dad, he wanted to try. He took one step and was about to run when I got a hold of him. Once inside the store, he wanted to climb inside the cart, but he’s getting a little too big for that. That’s when someone pointed out Caroline’s Cart… and he loved it! He buckled himself up tight and proceeded to actively look at all kinds of store items. Our normal and stressful five minutes max store time turned into an hour and fifteen minutes… AND he was happy! I typically expect a meltdown after five minutes and leave the store feeling completely exhausted, but this was a delightful shopping experience, the best in years! 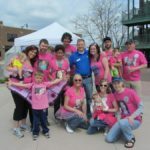 Thank you for all the work the Kenadi Jean Weis Foundation does for the kids in our community!